Madison Pidgeon raised the 1,308-pound grand champion steer, which sold for $7 a pound to Paris & Washington Insurance, represented by Kelly (left) and Hunter Palmer. 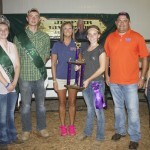 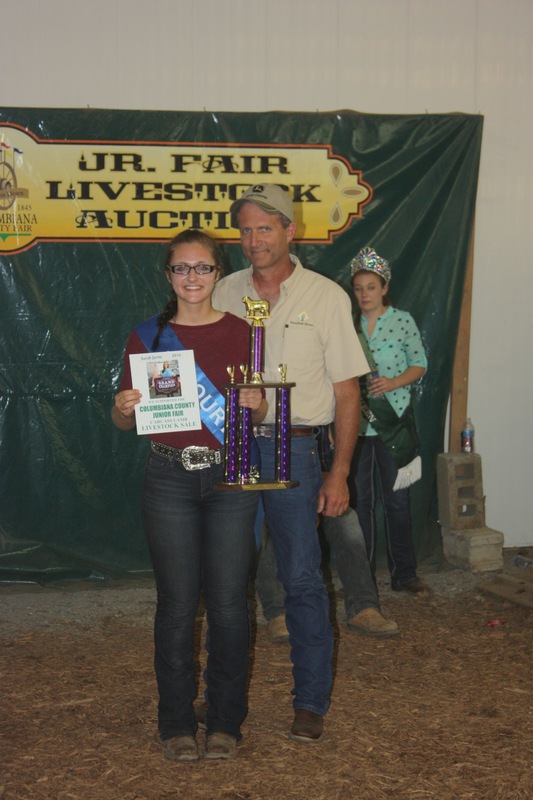 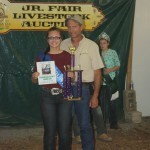 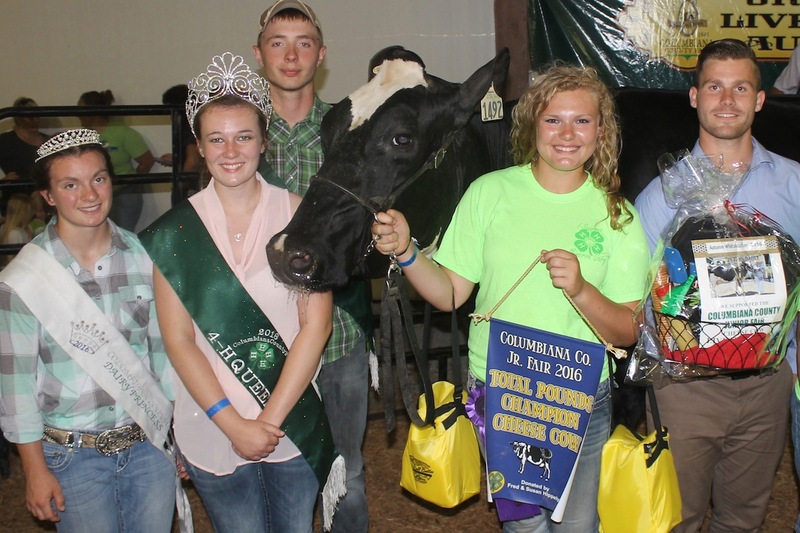 The Columbiana County Fair junior fair market steer, dairy beef feeder and cheese sales were held Aug. 4. 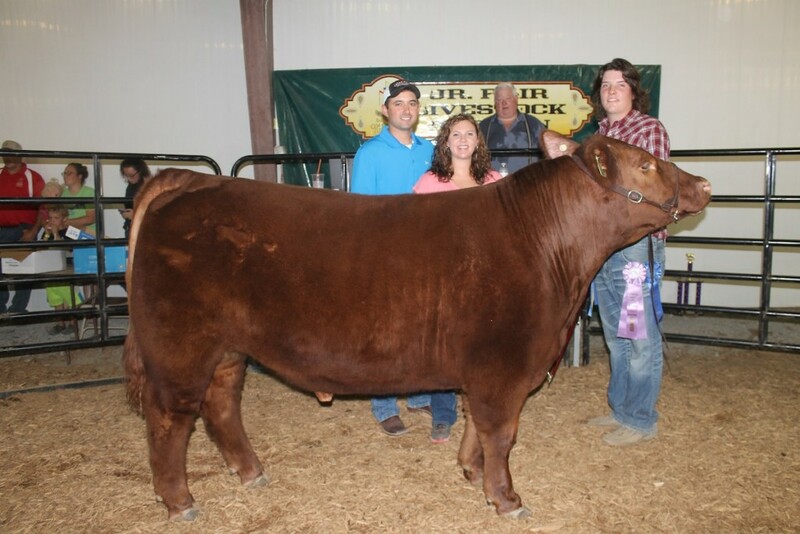 The remaining market livestock were sold Aug. 6, so scroll down to see the full sale results. 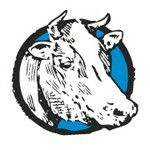 Buyer: RL Landscape Group Inc, Row Services, LLC. 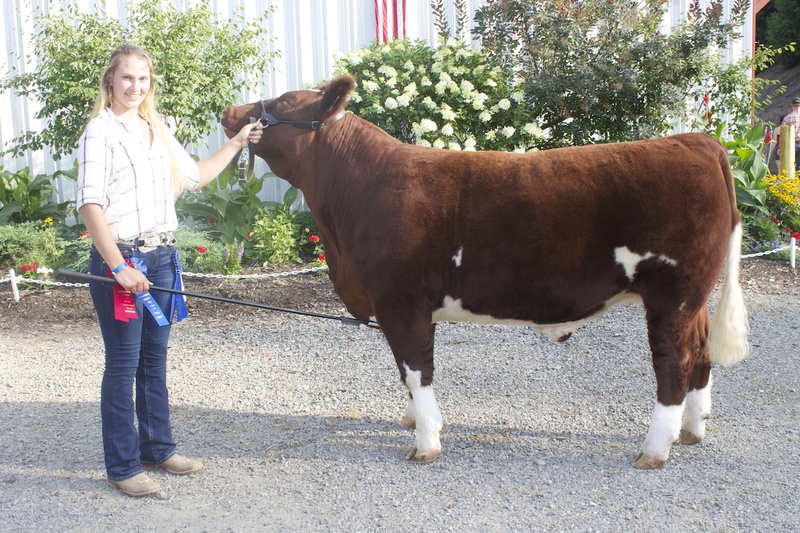 * The grand and reserve champion project award is based on the exhibitor’s skillathon, showmanship and live animal conformation. 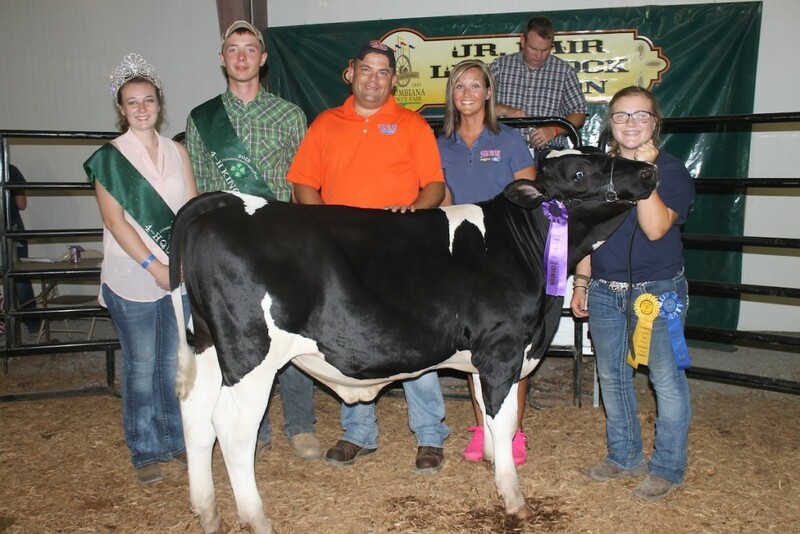 Kirstin Smith’s 615-pound grand champion dairy beef feeder sold for $3 a pound to Sarchione Auto Sales, represented by Joe Sarchione and Amanda Metts. 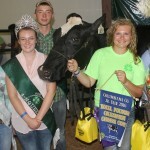 Also pictured are the fair royalty, Vaughn Unger and Brandon Veiock. 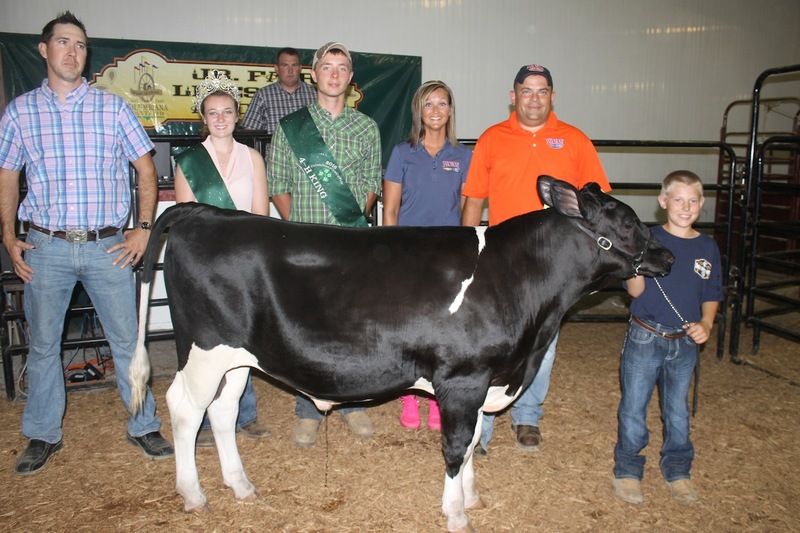 Levi Blake sold his 622-pound reserve champion dairy beef feeder to Sarchione Chevrolet, represented by Amanda Metts and Joe Sarchione. 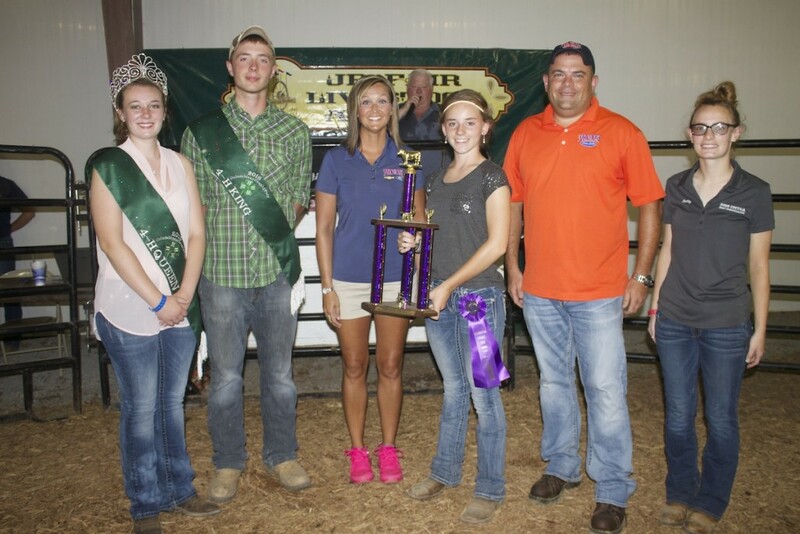 Also pictured are the fair royalty, Vaughn Unger and Brandon Veiock, and trophy donor Tim Herron. 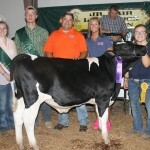 Autumn Whiteleather entered the champion cheese cow, total pounds. 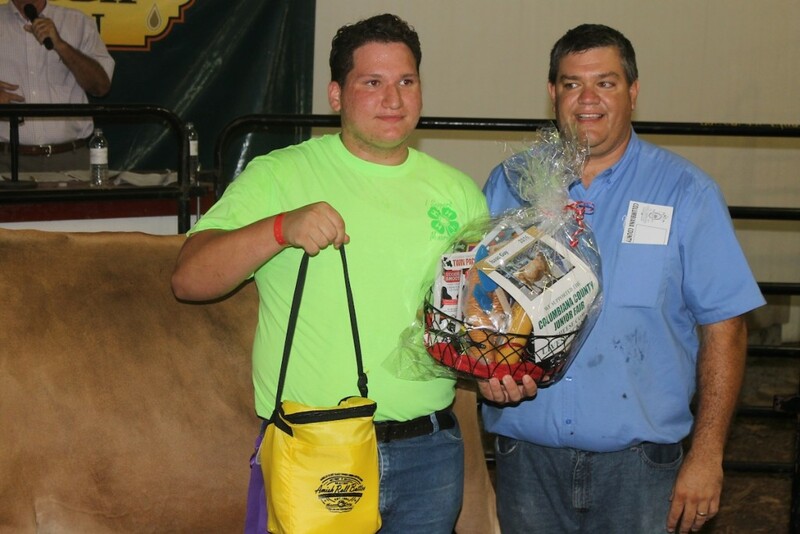 Paris & Washington Insurance, represented by Hunter Palmer, paid $4,500 for the cheese basket. 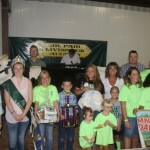 Also pictured are representatives of Minerva Dairy. 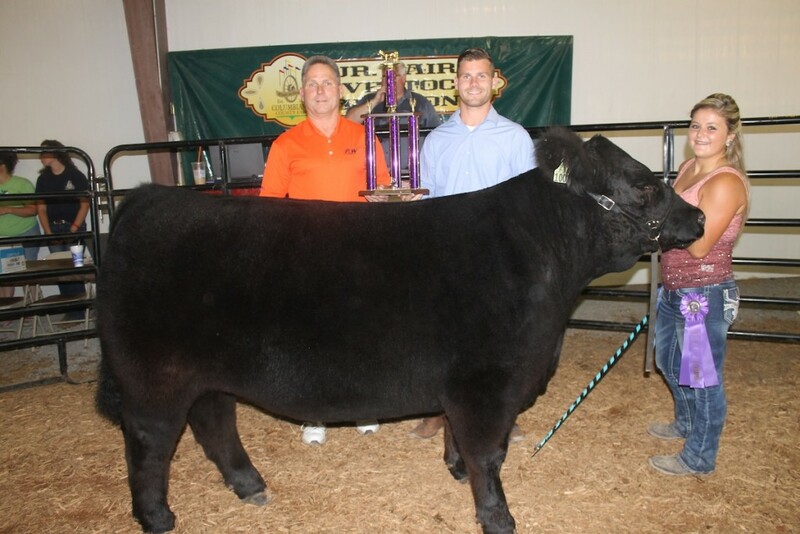 Isaiah Chestnut sold his reserve champion steer, weighing 1,385 pounds, for $5.50 a pound to MAC Trailer Mfg., represented by Chad and Rachel Raber. Witmer’s Feed and Grain, represented by Brian Beck, paid $2,000 for Isaac Guy’s yield champion cheese basket. 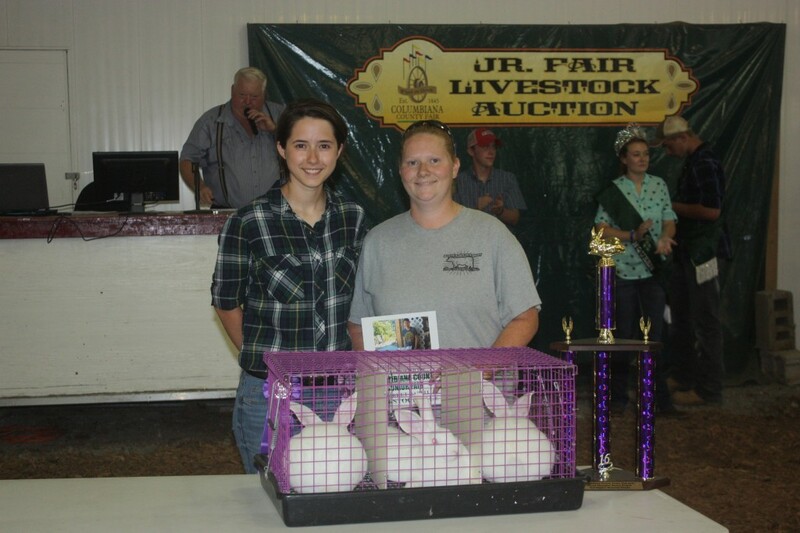 Pidgeon Family Farms, represented by Celina Gaudio, Taylor, Tarry and Sharon Pidgeon, paid $3 a pound for Emily McDonald’s 1,490-pound reserve champion carcass steer. Paris & Washington Insurance paid $3 a pound for Emily McDonald’s 1,323-pound reserve champion project steer, which was also the champion Columbiana County Born and Raised. Alexa Baker raised the grand champion carcass steer, weighing 1,284 pounds. 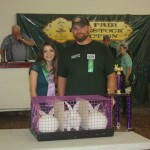 It sold for $3.75 a pound to Sarchione Auto Sales, represented by Amanda Metts and Joe Sarchione. 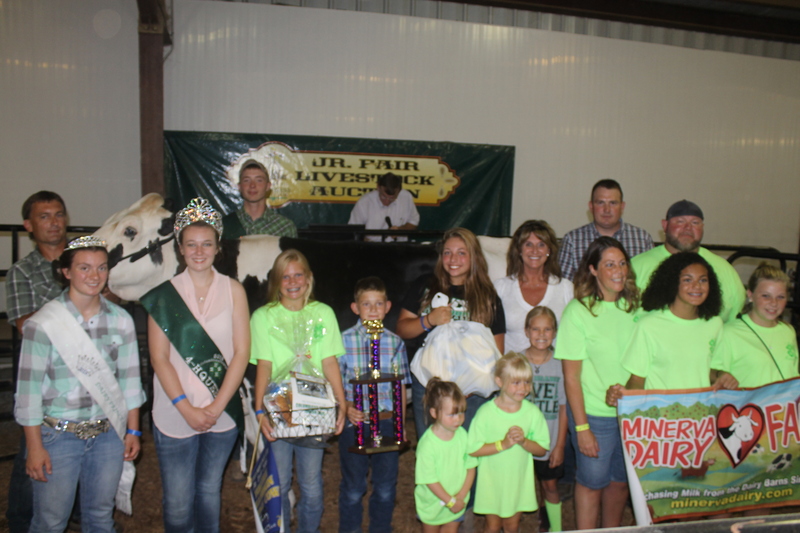 Bailey Campbell (third from left), sold her grand champion cheese for $6,000 to MAC Trailer Mfg., represented by Jenny Conny. Also pictured are the fair king and queen, Brandon Veiock and Vaughn Unger; Columbiana County Dairy Princess Kelly Ginnetti; trophy donor Randall Kiko; and representatives of Minerva Dairy, which has donated the cheese since the project’s inception 32 years ago. 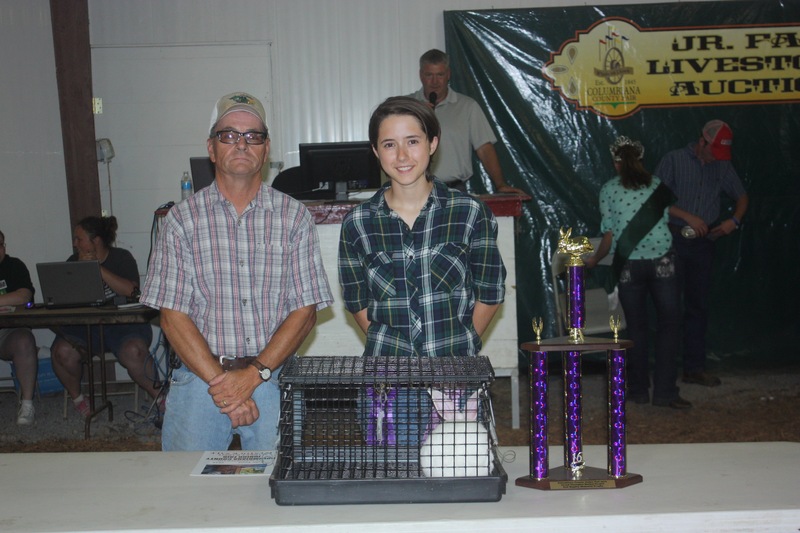 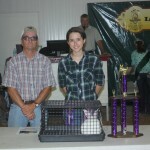 The Columbiana County grand champion pen of market rabbits was raised by Kylie Youst. 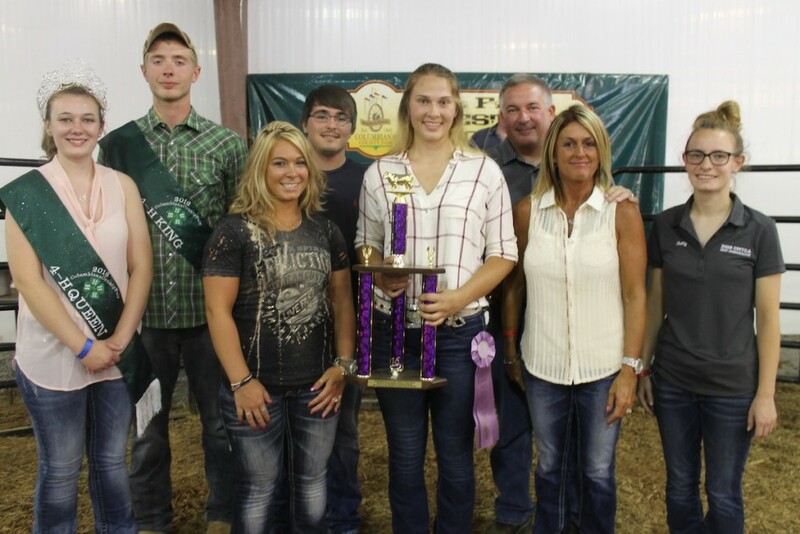 The pen, weighing 14.40 pounds, sold for $95 per head to Hilltop Lawn and Garden, represented by Heather Baker. The 12.20-pound reserve champion pen of market rabbits was produced by Mickalia Ayers. 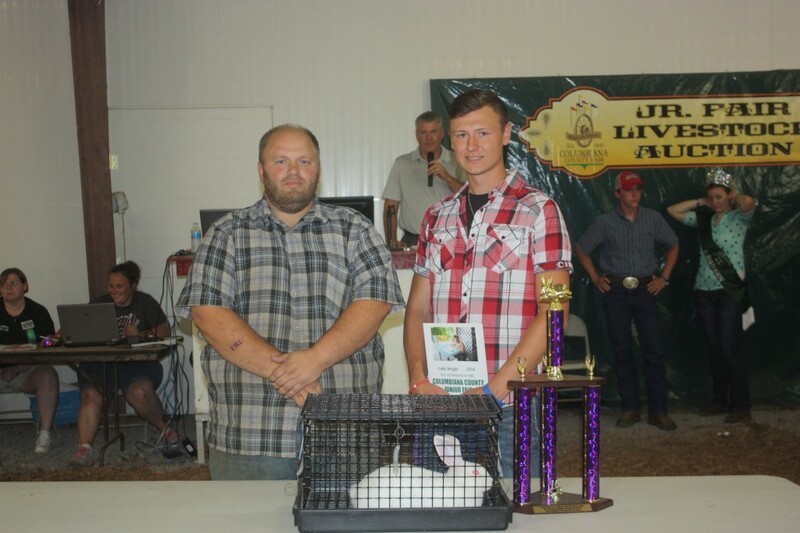 The pen sold for $75 per head to Penn Ohio Rabbit Breeders, represented by Dan Matthews. 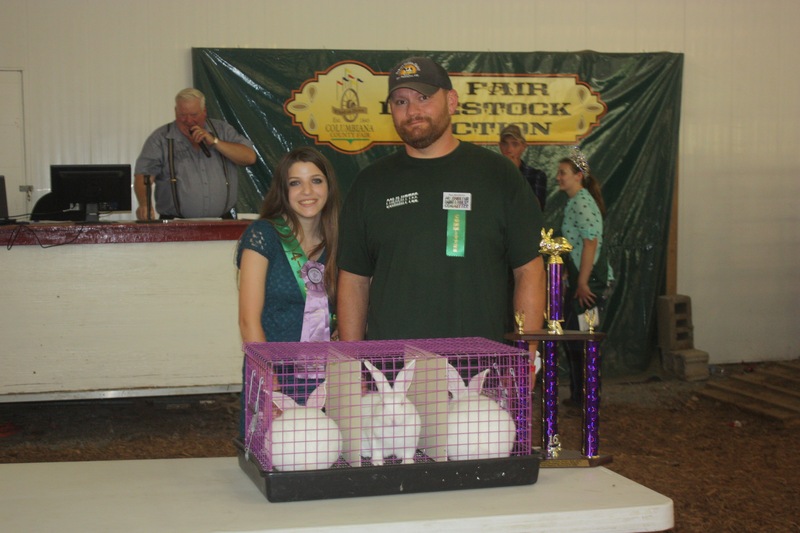 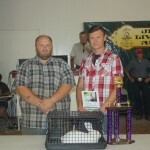 Cody Wright exhibited the 2016 Columbiana County Fair grand champion rabbit market fryer. 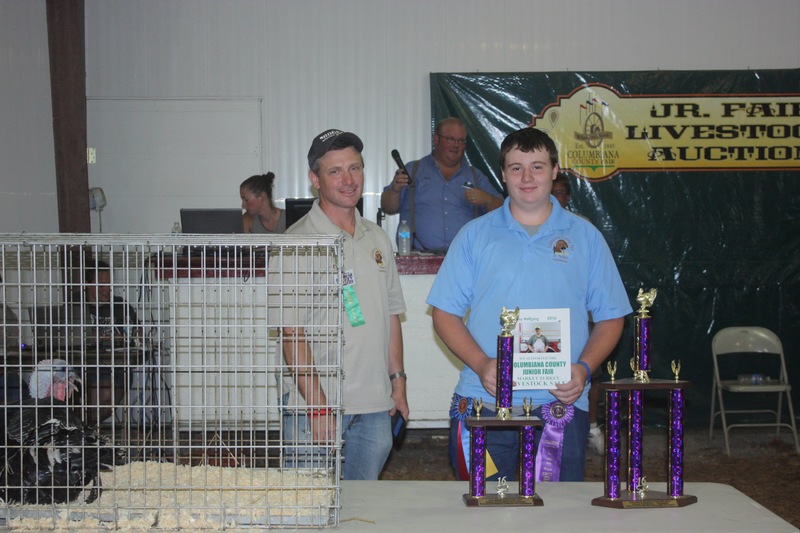 At 4.80 pounds, the fryer sold for $100 to Matthew Earl of Lane View Farms. 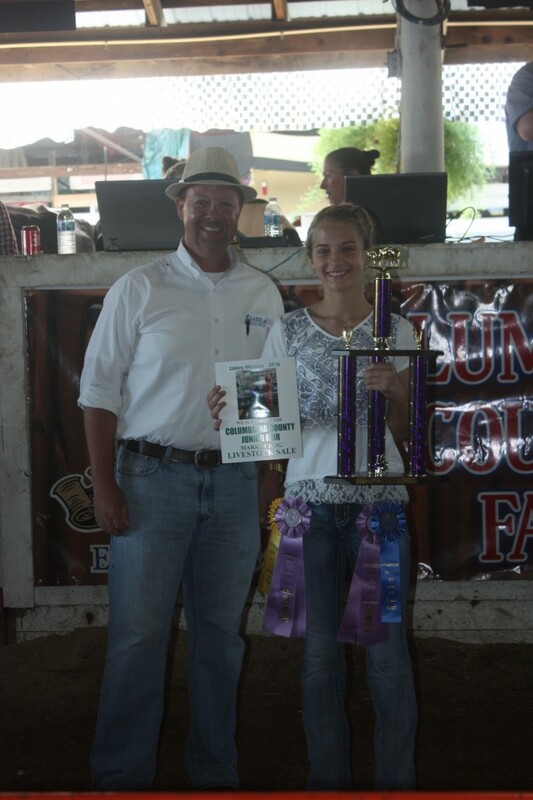 The reserve champion market fryer was raised by Kylie Youst. 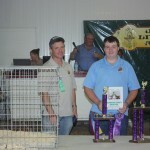 With a pen weight of 5 pounds, it sold for $180 to Little Lane Boarding Kennels, represented by Dean Barrick. 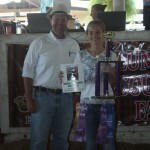 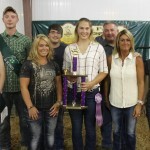 Calee Lukowski exhibited the Columbiana County Fair grand champion market poultry carcass. 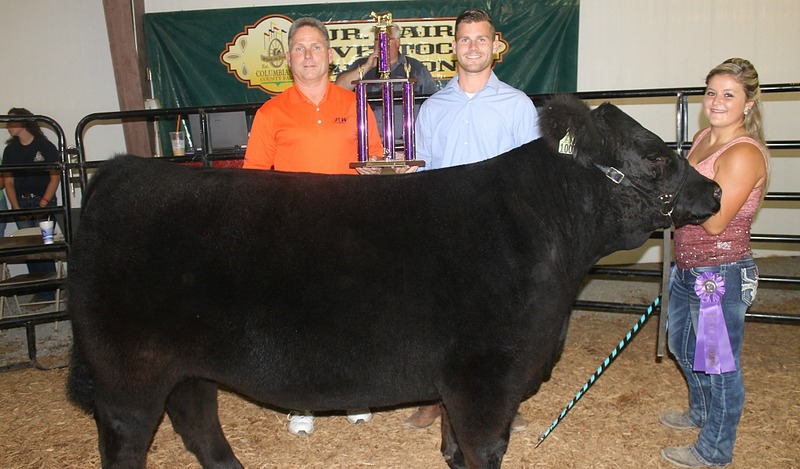 With a carcass weight of 30.80 pounds, the pen sold for $225 per head to Case Farms, represented by Chuck Sluss. 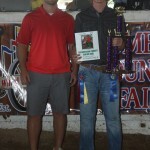 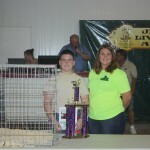 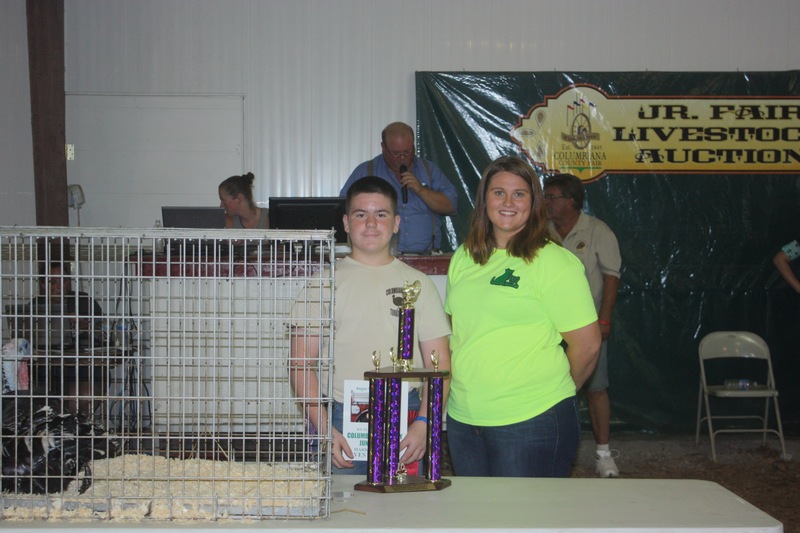 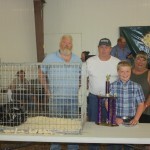 The Columbiana County fair reserve champion pen of market poultry was raised by Dylan Rothwell. 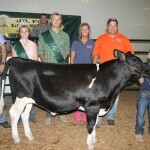 At 29.20 pounds, the pen sold for $400 per head to Baker’s Golden Dairy, represented by Deb Baker. 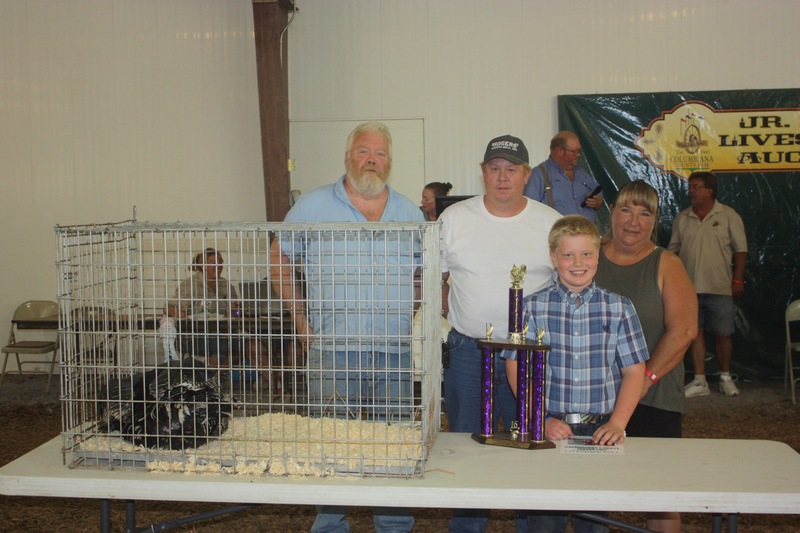 The 2016 Columbiana County Fair grand champion turkey was raised by Zeb Snyder. 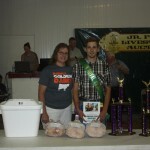 The 40-pound turkey was sold for $625 to Kieth Hebron and Bob and Cindy Black of Rogers Mill, Inc. and Hanoverton Feed. 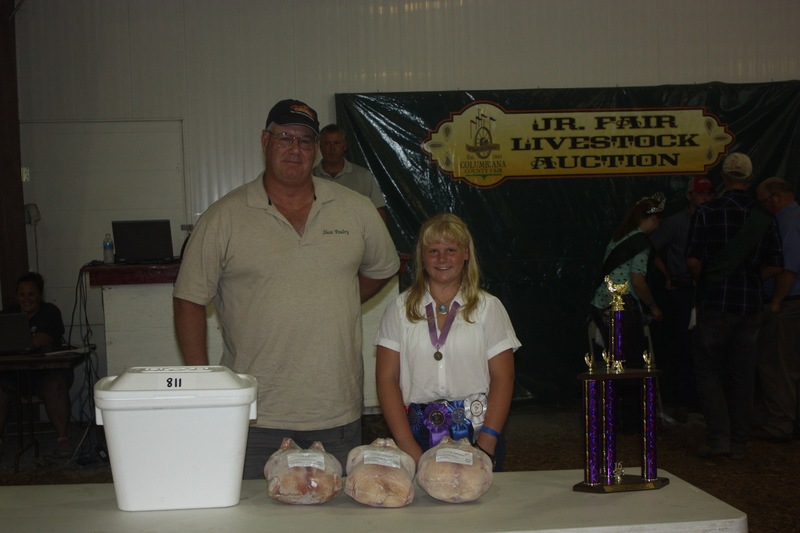 The 37-pound reserve champion turkey, raised by Emma Snyder, sold for $700 to Joseph Mong of J. D. Mong Enterprises. 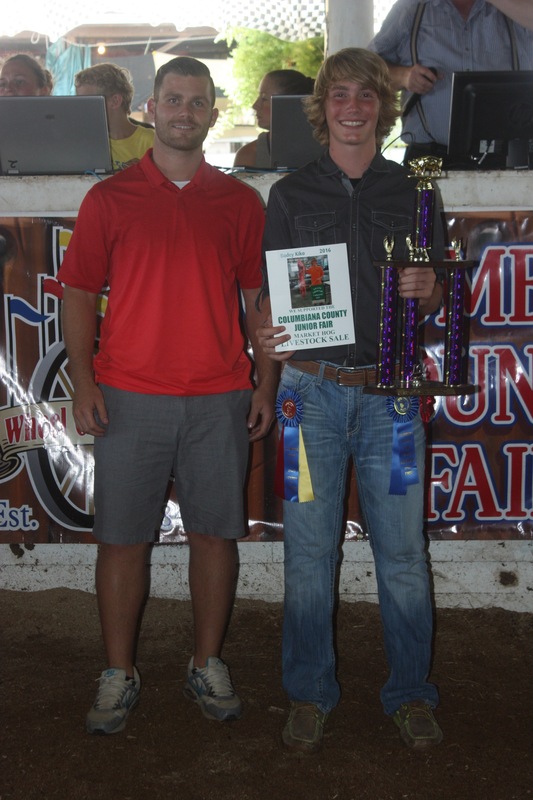 Troy Wolfgang raised the 2016 Columbiana County Fair grand champion carcass turkey. 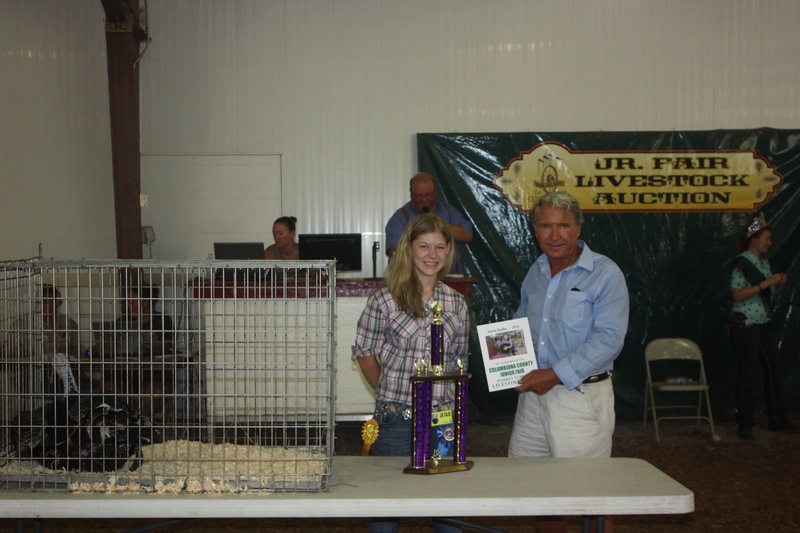 With a carcass weight of 24 pounds, it sold for $400 to Ramsey Hoof Trimming, represented by Don Wolfgang. 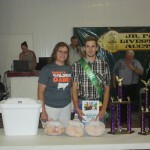 Angus Cope exhibited the 33-pound reserve champion carcass turkey. 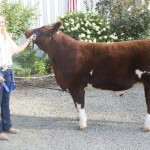 The carcass sold for $275 to Feo Farm Kennels, represented by Autumn Feo. 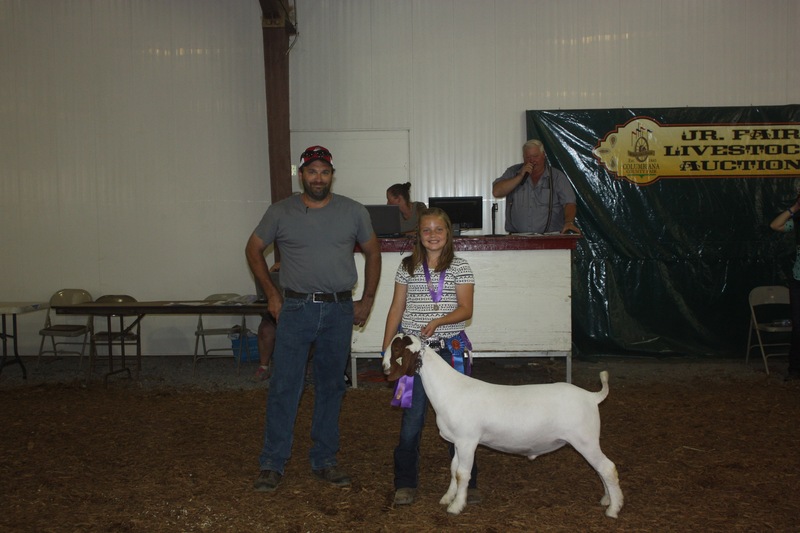 The 2016 Columbiana County Fair grand champion market goat was shown by Emmy Jones. 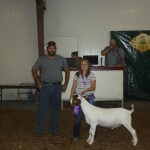 The goat, weighing 112 pounds, sold for $4 per pound to Patrick Souders, representing D & G Mechanical. 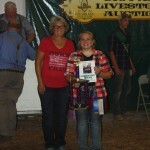 Ashley Hahn raised the reserve champion market goat, weighing 93 pounds. 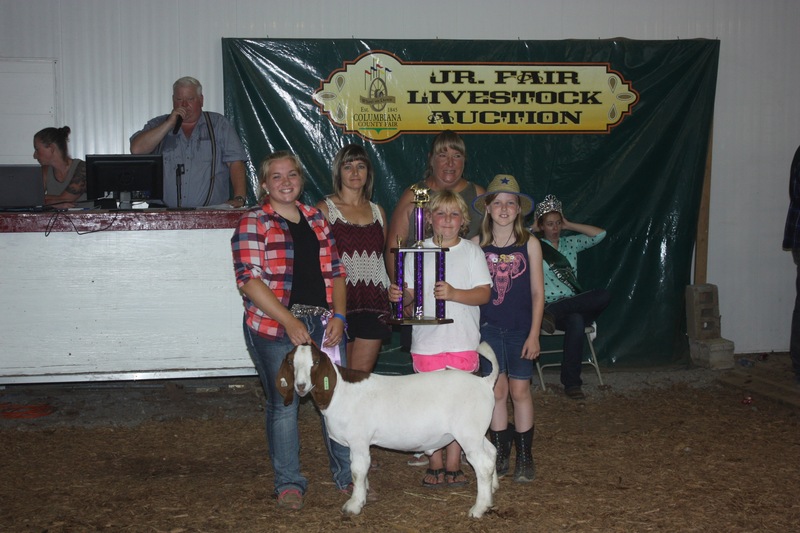 At $3.50 per pound, the goat sold to Krystal Campbell, representing DataCom, and Cindy, Kate and Makayla Black for Hanoverton Feed. 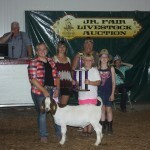 The grand champion goat fudge basket, weighing 7 pounds, was exhibited by Darby Miller. 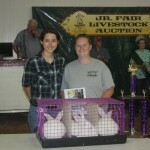 The basket sold for $700 to Wallace Farms Feed and Drive Thru, represented by Jennifer Wallace. 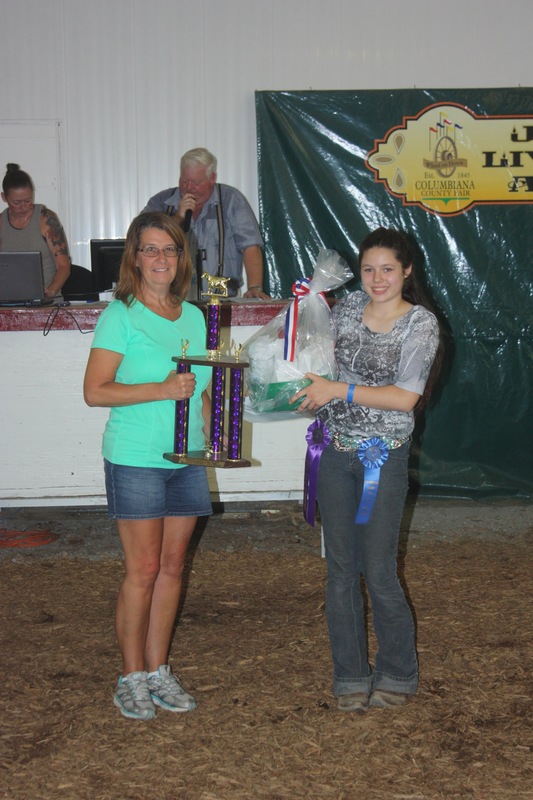 Amanda French exhibited the Columbiana County Fair reserve champion goat fudge basket. 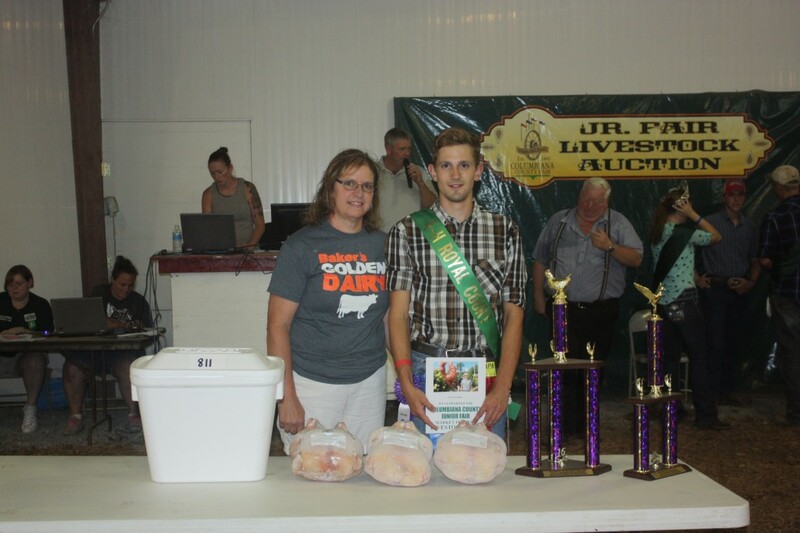 Weighing 4.88 pounds, the basket sold for $800 to County Recorder Theresa Bosel. 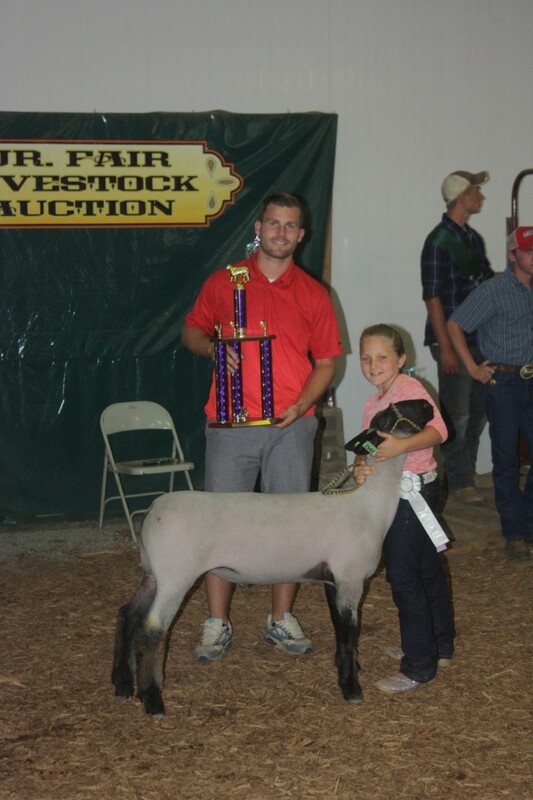 The 2016 Columbiana County Fair grand champion market lamb was raised by Lainey Mercure. 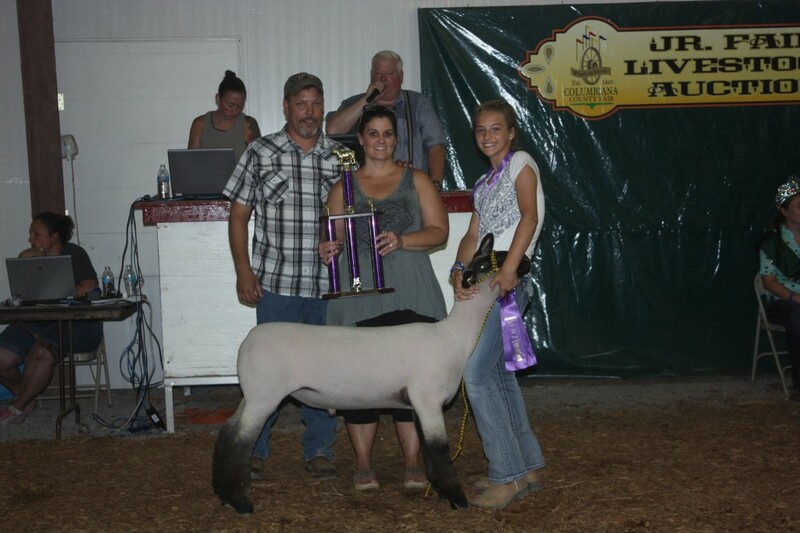 Weighing 154 pounds, the lamb sold for $10 per pound to Dave and Chrissy Norris for NDC Heating and Cooling. 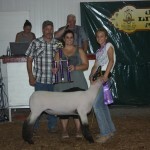 The reserve champion market lamb, raised by Kiersten Burton, weighed 144 pounds. 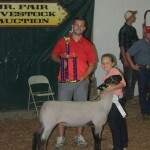 At $7 per pound, the lamb sold to Paris and Washington Insurance, represented by Hunter Palmer. 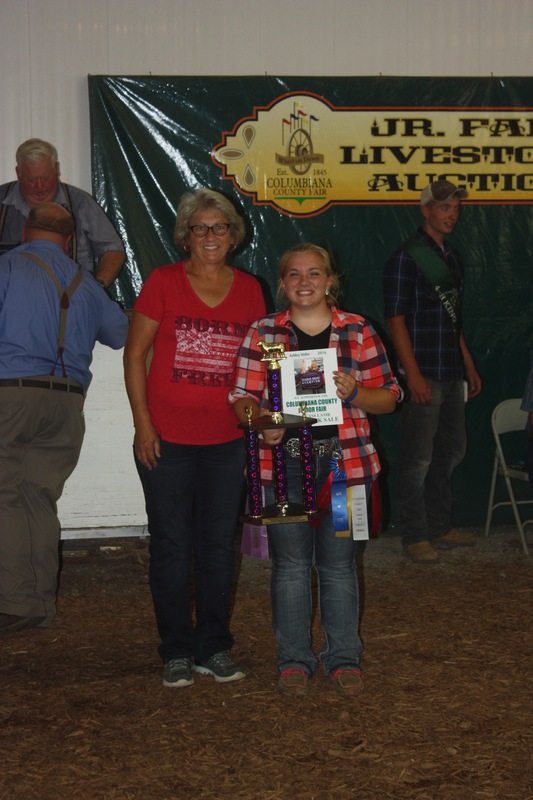 Sarah Jarvis raised the 2016 Columbiana County Fair grand champion carcass lamb. 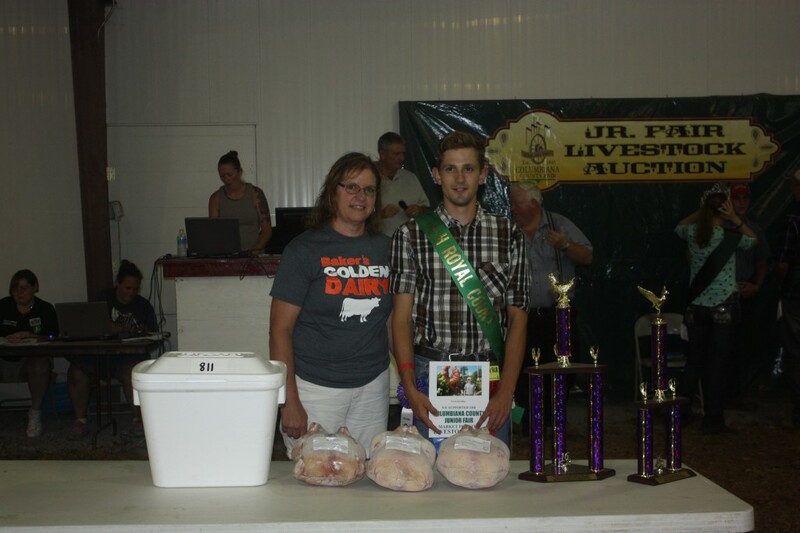 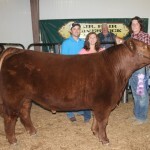 With a live weight of 123 pounds, it sold for $3.75 per pound to Deerfield Farm Services, represented by Doug Jarvis. 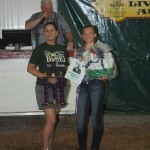 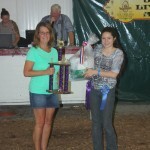 The Columbiana County Fair reserve champion carcass lamb was raised by Ashley Hahn. 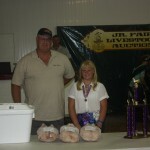 Weighing 130 pounds, it sold for $3.25 per pound to Diane Kiko for Kiko Meats. 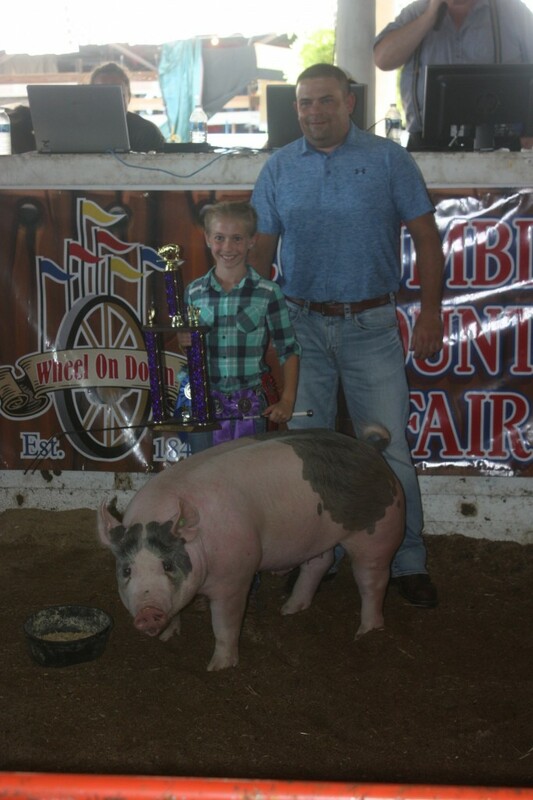 Kamryn Kiko exhibited the Columbiana County Fair grand champion market hog. 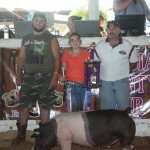 At 267 pounds, the hog sold for $10 per pound to Sarchione Chevy, represented by Joe Sarchione. 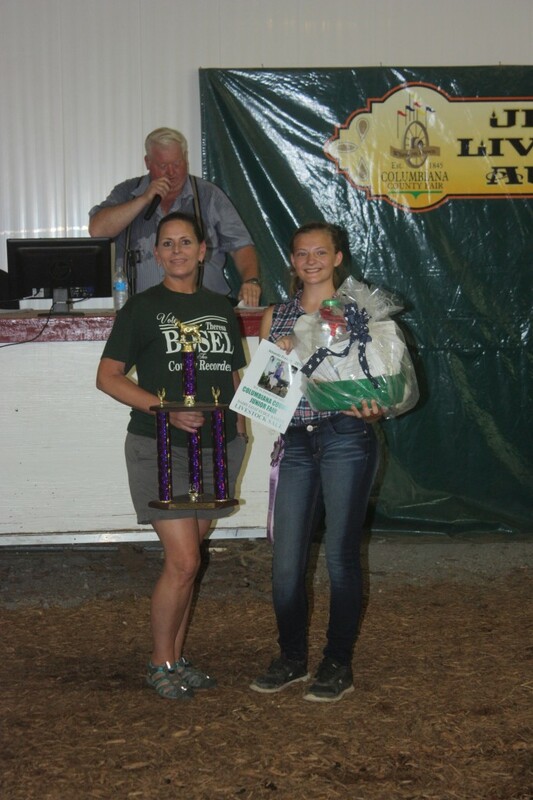 The 2016 Columbiana County Fair reserve champion market hog was raised by Natalie Kornbau. 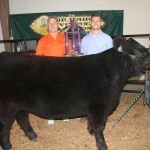 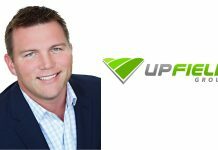 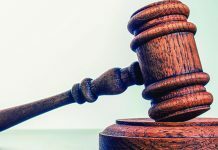 Weighing 271 pounds, it sold for $6.50 per pound to Spencer and Dan Rohr for RL Landscape Group Inc. and Row Services, LLC. 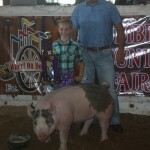 The grand champion carcass hog was exhibited by Bodey Kiko. 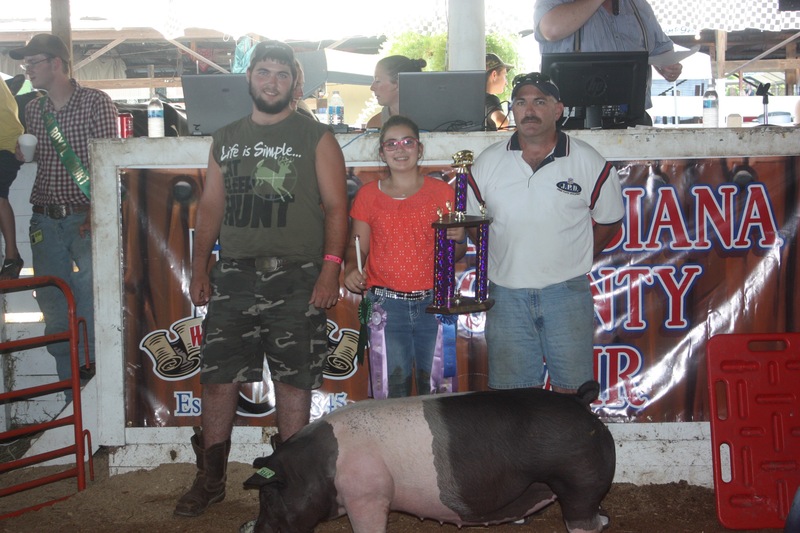 With a live weight of 255 pounds, the hog sold for $4.50 per pound to Kelly Palmer and Associates, represented by Hunter Palmer. 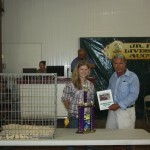 Lainey Mercure raised the reserve champion carcass hog, which had a live weight of 222 pounds. 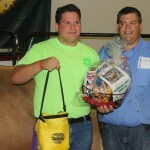 The carcass hog sold for $4 per pound to Crabb Insurance, represented by Dave Mollenkopf.